This looks like a fun, easy-to-organize, sociable format and I’m wondering if Moravian should try something like this. Seems to me it gives the experts a fast run while being an event that the vast majority of club members can run it. Bit the attendance doesn’t look all that spectacular. Would you say this format has been a success for GRAMP? It was still the Easter holiday week so many folk still away. Not that concerned. Look at the attendances from previous FS series and you’ll see we usually get 35 – 40+ folk along to most events and sometimes nearly 50 if the studes are back home from uni. We run 3 events and Maroc 3 and someone tallies up points for best 3 scores out of the 6. No prizes just the kudos! 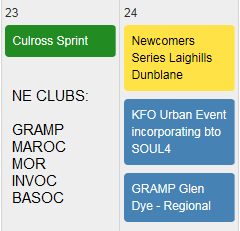 I would say big success for both clubs in terms of both coaxing old hands out after the winter (not all of us are night O addicts) and also as a regular series of CATI type events for newcomers – better than a one-off once a year although our Summer Series does the same job even better.